Iminosugars form undoubtedly the most attractive of carbohydrate mimics reported so far. In these structures, the substitution of the endocyclic oxygen of sugars by a basic nitrogen atom leads to remarkable biological properties and raises many challenges in organic synthesis. Since the discovery of their biological activity as glycosidase inhibitors in the 1970’s, these polyvalent molecules have progressively made their way from the laboratory to the clinic. The impressive series of discoveries in the field over the past ten years indicates clearly that it is “a boom time” for iminosugar chemistry and biology. The scope of their profile as inhibitors has been extended to a number of enzymes such as phosphorylases, glycosyltransferases or metalloproteinases, and iminosugars now constitute lead compounds for the development of new therapeutic agents for a wide range of diseases including diabetes, viral infections, lysosomal storage disorders and tumor metastasis. Latest developments, from iminosugar synthesis to their use in clinical studies, are presented in this book, which contains contributions from over fifteen of the major chemists, biochemists and drug developers in this rapidly expanding field. An extensive table correlating the structures of more than 600 iminosugars of therapeutic interest with their biological activities is also included in the book and should prove particularly useful to aid with the design and the discovery of novel bioactive substances. Iminosugars: From Synthesis to Therapeutic Application provides a unique resource for academic and industrial researchers working in the field of iminosugars and glycomimetics of biological and/or therapeutic interest: organic chemists, medicinal chemists, carbohydrate chemists and medical scientists. 1. Iminosugars: past, present and future (Philippe Compain and Olivier R. Martin). 2 Naturally occurring iminosugars and related alkaloids: structure, activity and applications (Naoki Asano). 2.4 α- and b-Galactosidase inhibitors. 2.6 Concluding remarks and future prospects. 4. Iminosugar C-glycosides: synthesis and biological activity (Philippe Compain). 4.2 Synthesis of iminosugar C-glycosides. 4.3 Biological activity of iminosugar C-glycosides. 5. Imino-C-disaccharides and analogues: synthesis and biological activity (Pierre Vogel, Sandrine Gerber-Lemaire and Lucienne Juillerat-Jeanneret). 5.4 Glycosidase inhibitory activities of imino-C-disaccharides. 5.5 Efficient combinatorial method for the discovery of glycosidase inhibitors. 5.6 Antitumour activity of new a-mannosidase inhibitors. 6. Isofagomine, noeuromycin and other 1-azasugars, iminosugar related glycosidase inhibitors (Oscar Lopez and Mikael Bols). 6.2 1-Azasugars that are piperidines (isofagomine, noeuromycin, etc.). 6.4 1-Azasugars that are oxazines. 6.5 1-Azasugars that are piperidones. 6.6 Sulphur-containing analogues of 1-azasugars. 6.7 Slow inhibition and thermodynamics of binding. 6.8 Are 1-azasugars (and iminosugars) transition state analogues? 7. Iminosugar-based glycosyltransferase inhibitors (Lisa J. Whalen, William A. Greenberg, Michael L. Mitchell and Chi-Huey Wong). 7.1 Biological role and structural features of glycosyltransferases. 7.2 Development of inhibitors of glycosyltransferases. 8. Transition state analogue inhibitors of N-Ribosyltransferases (Vern L. Schramm and Peter C. Tyler). 8.3 Purine nucleoside phosphorylases (PNPs). 8.4 5’-Methylthioadenosine (MTA) nucleosidases and phosphorylases. 9. Iminosugars as antiviral agents (Pamela A. Norton, Baohua Gu, and Timothy M. Block). 9.2 The relationship between glucosidase inhibition and antiviral action. 9.3 Fate of viral glycoproteins in glucosidase-inhibited cells. 9.4 Specificity of glucosidase inhibition. 9.5 N-Alkyl DNJs inhibit virus growth by non-glucosidase inhibitory mechanisms – other potential activities of these compounds. 9.6 New directions for improving glucosidase inhibitors as antiviral agents. 10.3 Lysosomal enzyme biosynthesis and ER-associated degradation (ERAD). 10.4 Active-site-specific chaperones and iminosugars. 10.5 Basic requirements for effective ASSCs. 10.7 Examples of ASSC therapy for lysosomal storage disorders. 11. Iminosugar inhibitors for substrate reduction therapy for the lysosomal glycosphingolipidoses (Terry D. Butters). 11.1 Glycolipid lysosomal storage diseases. 11.2 Options for glycosphingolipidosis therapy. 11.3 Iminosugars for substrate reduction therapy. 11.4 Iminosugars as inhibitors of glycolipid biosynthesis. 11.6 Prospects for iminosugars as therapeutics. 12. Iminosugar-based antitumoural agents (Yoshio Nishimura). 13 Medicinal use of iminosugars (Timothy M. Cox, Frances M. Platt and Johannes M. F. G. Aerts). 13.3 Clinical application of iminosugars as medicines. 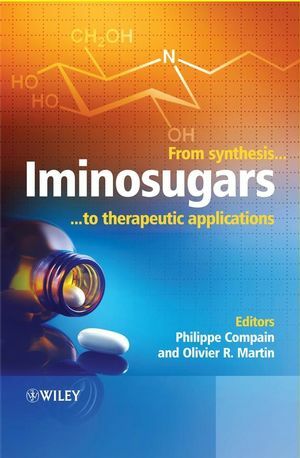 14 Tables of iminosugars, their biological activities and their potential as therapeutic agents (Philippe Compain, Valérie Desvergnes, Virginie Liautard, Christelle Pillard and Sylvestre Toumieux).